All Michael Vann bows made after 2004 now contain a microchip. It is located just ahead of the bow screw and protected by a pernambuco plug. When the scanner is turned on, a radio wave signal is sent to the implanted chip. The chip sends it's number back to the scanner where it can be easily read in the viewing window. The interaction between chip and scanner takes less than a second, allowing the identification of instruments and bows on demand. These chips are easily installed through the end pin hole into the end block of bowed instruments. 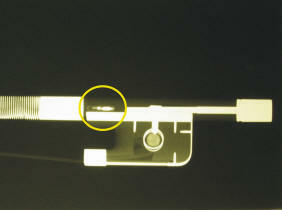 A non-invasive process which hides the chip but can still easily be read. In bows it is implanted ahead of the screw shaft and can be read through all types of winding including silver and gold wire. About the size of a grain of wild rice, this chip weighs only .06 gram.